“Having this much fun is a crime.” Judging from Thursday’s new Ocean’s 8 trailer, all eight of these ladies are committing major ones, besides, you know, casually stealing jewelry from the Met. Academy Award winners Sandra Bullock and Cate Blanchett join forces with Sarah Paulson, Rihanna, Awkwafina, Mindy Kaling and Academy Award nominee Helena Bonham Carter to steal the jewels off of Academy Award winner Anne Hathaway and put over $16 million dollars into each of their bank accounts. As Awkwafina points out in the trailer, “that’s a lot.” Yes, most definitely. That could buy more than a new life for all of them. The stakes are high, the dresses are on point and the glamour never looked so dangerous—or is it the other way around? Academy Award nominee Gary Ross (Big, Seabiscuit, The Hunger Games) writes and directs the film, based on the characters from George Clayton Johnson’s original story, upon which both the 1960 Rat Pack film Ocean’s 11 and Steven Soderbergh’s 2001 remake were based. 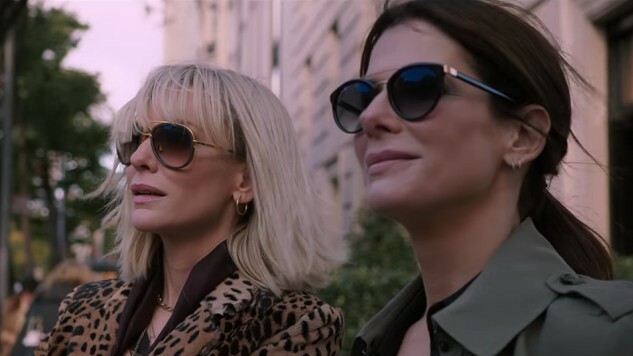 Check out the first footage from Ocean’s 8 here and the film’s previous trailer here. It’s game on, ladies, on June 8.